Find your perfect hen weekend venues in London with our hen party accommodation info! The latest thing in hen weekend venues is Hen Houses, more relaxing than being in a hotel hotels and perfect for your hen party accommodation. Lots of hens who come to our Exmouth Market (London) venue for a fascinator making workshop come from outside London. London is a great venue to host a hen party and I’ve searched out some hen weekend venues for you. With brilliant transport links and a lot of fun hen party activities it’s the ideal location. However, if you’re not from my town it can be a little daunting to work out which area to stay in. I’ve done the legwork in this series of 3 blog posts to help you find your perfect hen party accommodation. The latest thing in hen party accommodation is “Hen Houses”, it’s more relaxing than being in a hotel – you can arrive home from partying when you want without any amused/bemused reception staff to greet you. Wake up when you want to, cook your own special hangover-cure breakfast. Hang out in the house and invite The Glam Hatters to come and give you a fascinator making workshop in the comfort of your home-away-from-home! There are a lot of beautiful hen cottages scattered around the countryside but it seems London has not yet catered for this market. Hen Party Accommodation in Russell Square, Central London. So I dug a little deeper and found that Air B&B have lots of gorgeous houses that you can rent as hen weekend venues. They are close to the centre of town and seriously cool. One thing to bear in mind though – a lot of the owners say no partying in the house after 11pm. I know that you will probably be out until the early hours so that won’t affect you but do bear in mind that this list is for places to hang out having a lovely time in the day time and to sleep in – these are not houses to throw a party in! If that’s what you are looking for, let me know and I will write another post about party houses/venues! 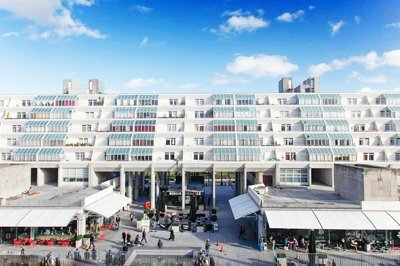 This is a brilliant place to locate your hen party and it is the best central location…open space….very bright in the iconic Brunswick Centre, in the heart of Russell Square which includes many shops, restaurants and cafes below the apartment. 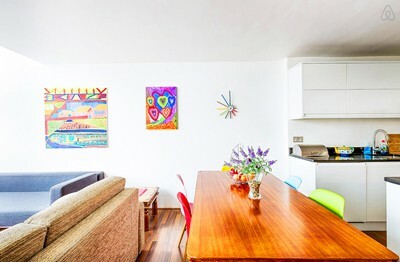 This apartments is literally a 1 minute walk from Russell Square tube which is on the Picadilly Line and is 3 stops from Leicester Square and also 3 stops (and one change) from our Glam hatters’ Exmouth Market venue! Or, if you hire this apartment you can stay in with The Glam hatter Girls sitting everyone around this table, bathed in sunlight and teaching a fascinator making hen party! There are stacks of restaurants and high street shops in and around Russell Square but wander another 4 minutes away to Rugby Street and pop in and say Hi to my friend Maggie at Maggie Owen. She sells drop dead gorgeous jewellery and other fantastic things that she hand picks from independent designers. I’ve know Maggie forever and her shop still takes my breath away! 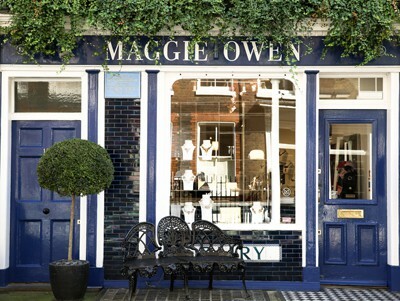 Just around the corner from Maggie Owen is Lamb’s Conduit Street. It’s rated as one of “London’s Top 5 Shopping Streets” by The Guardian. My fave is The Darkroom – check it out but don’t take your credit card! There are also a multitude of independent restaurants on this street and they are so, so stylish. Guys I hope you find this post useful. If you have an amazing house that you rent out for hen party accommodation or if you have a recommendation please do leave a comment. I’d love to hear from you. 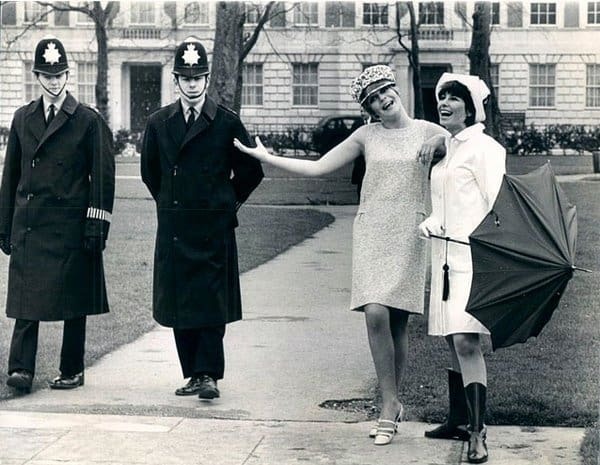 Wishing you a fabulous London Hen Party! For a full list of Glam Hatters’ crafty hen workshops click here. Check out my blog for Hen Party Accommodation in Shoreditch (East London) here. For all the house listed here and lots, lots more (they are a worldwide service) check out Air B&B here.